Excavating the nest hole. 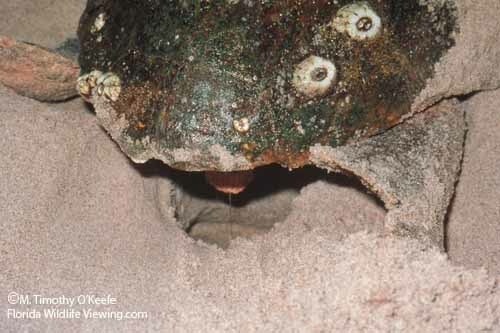 It's amazing that an animal as large as the sea turtle, seemingly as clumsy on land, is able to build a nest hole that is almost perfectly round. The completed nest hole averages about 18 inches deep, roughly 10 inches in diameter and is bottle shaped. The female is able to dig deeply by raising her head and pushing up with the fore flippers. This semi-diagonal position permits the hind flippers to dig deeper.